While cities such as Manehatten and Canterlot were known for their night life and constant buzz, the small town of Ponyville tended to shut down after sunset. The hardworking ponies of the rural community retreated into their homes as the hour grew late, fleeing the chill of the autumn night to relax near warm fires before slipping off to bed. Yet, on this night, the quiet streets of Ponyville were not empty. A lone figure strode down one road in particular, coming from the direction of the Everfree Forest. It was a figure who had, in the past, sent all of Ponyville running to hide. A pony who was spoken of only in whispers, avoided like a plague, and who possessed haunting eyes that glowed beneath the shadow of her hood. Continuing along the streets, the figure approached her destination: the Ponyville Library. The library shone like a lighthouse. Its windows glowed, their light interrupted only by the occasional shadow of a pony moving within. Muffled music seeped through the walls to dance on the wind, drawing in the cloaked figure who, upon reaching the door, knocked three times. “All right, have fun,” Twilight said before going back to the library door to greet another set of guests. As Zecora made her way across the room, she received warm greetings from a number of ponies. Zecora gladly returned each greeting with a warm smile and the occasional laugh. Still, the zebra did not allow herself to become swayed from her path, keeping her course focused until she passed through the basement door and began descending the stairs. Upon reaching the bottom of the steps, Zecora saw the full extent of the games that had been setup. There was Pin the Tail on the Pony, but in proper Nightmare Night spirit there were other games too. She saw a barrel filled with green water and apples, perfect for bobbing, as well as a game of Spider Toss. Pinkie Pie nodded, zipping away and returning with a box held in her teeth. “Pick your color,” she mumbled out around the box in her mouth. Pinkie Pie huffed, taking Zecora’s challenge seriously as she went around the room to find more ponies for the game. Soon, a half dozen guests were gathered in front of one wall in the library’s basement, on which hung a poster of a pony that was missing its tail and had a small ‘X’ on its flank. It was a game of Pin the Tail on the Pony, and Pinkie Pie was out to reclaim her title as Ponyville champion from Zecora. With a huff, Pinkie Pie gave a nod, signaling that she was ready to be spun. Yet, despite the disorienting spin, Pinkie Pie was able to make a beeline for the poster. She placed her pink, paper pony tail and pushed the pin in as deep as it would go before she stepped back and removed her blindfold. Once Pinkie Pie registered how well she had done, a broad smile exploded onto her lips. She somersaulted back over to Zecora and pointed a proud hoof at the poster. “HA! Bulls-eye!” Pinkie Pie boasted while the other ponies playing cheered. Zecora, however, seem unfazed and maintained her confident smile. She was blindfolded and spun while Pinkie Pie’s tail was removed from the poster so that she would have an equal chance to hit the bulls-eye. Still, after Zecora was spun, she did not walk forward towards the poster. She instead shifted her stance ever so slightly and brought her head back to one side. She then swung her head forward and threw her pin, with the attached paper tail, into the air. All eyes in the crowd watched as the tail arched through the air, and gasped when the pin stuck to the posters directly on the ‘X’. It was a perfect bulls-eye. “How... how did you?” Pinkie Pie asked as Zecora removed her blindfold with a proud smile. “It’s hard enough for you, as I recall. Last time we played you missed the wall,” Zecora said with a small laugh. Rainbow Dash huffed, not about to back down from a challenge, even when she was the one that had made the challenge in the first place. “Yeah, well, I was just tired last time. I’d been bucking clouds all day, but this time I’m going to beat you both.” With that Rainbow Dash grabbed one of the paper pony tails and secured her own blindfold. “You sure about this, Rainbow Dash? I mean... you’re not really good at this game,” Pinkie Pie noted, remembering a time when Dash pinned the tail on somepony’s flank. “But Rainbow Dash-” Pinkie Pie tried to warn. Still, her words came too late. Rainbow Dash soared forward in the completely wrong direction. With a loud crash, Rainbow Dash collided with the basement’s chandelier and then dove straight into the Bobbing for Apples barrel. The impact caused a huge splash, which sent green tinted water and apples flying everywhere. The floor, ceiling, walls, books, and party guests were all doused in the liquid. A party guest lifted his hoof out of a puddle with a grimace. “What is with this water? Why is it sticky? “Whoa, what happened down here?” Twilight asked, she and Rarity standing at the top of the basement staircase, overlooking the disastrous mess. “Oh, Twilight, don’t worry, I’ll take care of it,” Rarity offered politely. “Oh, of course,” Rarity chuckled confidently. “All it takes is a flick of my horn and...” With that she tossed her head as a wave of light burst out from her horn. The spell washed over the entire room, doing nothing at first. Yet, once it began to recede, the spell drew up the punch and condensed the spilled liquid into a single floating sphere near Rarity’s head. It was at this moment the lights all around the library went out, causing a few panicked screams as well as a resounding splash. The darkness didn’t last for long. The candles and oil lamps regained their flames quickly, and the library was once again filled with light. The sudden and short lived darkness left almost every party guest mumbling in concern and confusion. Soon, most of the party goers went back to their games, food, and dancing, but one did not. Zecora made her way to the library’s front door, and poked her head outside while keeping her hooves just inside the door frame. She glanced up and down the street, but saw nothing out of the ordinary. Zecora shrugged, muttered something under her breath in her native tongue, and turned to rejoin the party, though for the rest of the evening she remained slightly on edge. A few days later, Twilight Sparkle stifled a yawn as she made her way down the library steps. Morning light streamed through the windows, and the sweet aromas of breakfast drew Twilight from the covers of her bed. It was unusual for Spike to be up so early, but Twilight wasn’t about to complain once she stepped into the kitchen and saw Spike making oatmeal. “Uh-huh,” Twilight said with a disbelieving tone. “What makes you think that?” Twilight asked before she placed a spoonful of oatmeal in her mouth. “Well, I was coming out of the bathroom and going back to bed when I though I heard something moving around down here,” Spike explained. “You were already asleep, so I thought it might have been Owlowicious. Still, when I got down here I didn’t see anything, except that the door was cracked open. I must have forgotten to lock it and somepony was in here and...” Spike fell silent at this. He rubbed the back of his neck and anxiously waited for his punishment. Twilight honestly wasn’t that mad at Spike. He was always very good about locking up the library at night, and it was obviously an accident. In truth, Twilight didn’t think locking the door was that important. It wasn’t like there were any burglars in Ponyville. She, however, understood why Spike was so worried about it. Rainbow Dash had scared him with stories about Everfree creatures sneaking into homes around Ponyville. Ever since, despite her feelings that it wasn’t necessary, Spike had dutifully locked the library door every night. With that he ran out of the room, leaving Twilight to chuckle to herself as she continued to enjoy the oatmeal. She listened to the sound of Spike’s claws on the library’s second floor until they fell silent, a sign that he had reached and was making her bed. In that silence Twilight let the smile on her face widen. It was the kind of quiet she enjoyed: a moment where she could be alone with her thoughts. She spooned another bite of oatmeal into her mouth, and was about to take another when something felt wrong. Twilight turned her head away from her bowl to look at the rest of the kitchen. Her ears swiveled forward and she strained her hearing. The library almost felt too quiet for a moment, like she should have been able to hear something. Letting her eyes slowly scan the room, Twilight tried to find the the source of the strange disturbance. None of the cupboards were open. The sink wasn’t dripping. The only thing not put away was the pot of oatmeal Spike had set down on the counter. Nothing was out of place, yet something was wrong. Twilight shook her head, trying to banish the strange, sudden paranoia, and returned to eating her oatmeal. She sunk the spoon down into the mush, lifted it up, and after licking her lips placed the spoonful in her mouth. “Ow ow ow ow ow ow ow!” Twilight repeated over and over as she danced on the tip of three hooves while using her right foreleg to fan her open mouth. She grabbed both glasses of orange juice from the table, guzzling down one and then the other as quickly as she could. “What? What happened?” Spike asked once Twilight finished drinking the orange juice. “I burned mythelf,” Twilight mumbled as she kept her tongue out of her mouth, letting it cool in the open air. Twilight took in a breath to argue, but the words died in her mouth. Spike was right. She was eating the oatmeal before he left without any trouble. That and, upon reexamining the oatmeal, Twilight found it was no longer burning hot. It had returned to its original, pleasantly warm temperature. “Oh, Spike, I’m sure you’re just letting your imagination get the better of you,” Rarity commented as she magically plucked a pin from the dragon’s back and used it to secure a piece of fabric. She was working on her Nightmare Night costume, and was sure it would wow and impress everypony... if she could get it done in time. “Worry too much about what?” a third voice asked. When Spike and Rarity turned to see who had spoken up, they saw Rainbow Dash entering the boutique. Rarity pushed her lips together and levitated off her work glasses. “My, I can’t imagine what you’d be making with that particular color combination. But yes, I do believe I have some spools I can part with. Just give me a moment to go check in the back.” With that, Rarity turned and trotted into the back of the store, leaving Spike and Rainbow Dash waiting in the front. “Whoa, Spike, you going to be a pin cushion for Nightmare Night?” Rainbow Dash teased as she playfully poked at one of the pins in Spike’s back. “But... you are a dragon,” Rainbow Dash pointed out. “That... or the library’s haaaauuunnnnttttteeed,” Rainbow Dash teased while wearing a mischievous grin and waving her hooves menacingly. Dash shouted the last part at the top her lungs, causing Spike to leap straight up into the air. He jumped high enough to reach and hang from one of the ceiling’s rafters, trembling like a leaf, while Rainbow Dash broke down into a fit of laughter. “What is going on out here?” Rarity asked as she stuck her head out of the back room. A few spools of fabric were levitating near her head, none of which were the colors Dash had asked for. “Rainbow Dash says the library is haunted!” Spike tattled while pointing a claw at Rainbow, who was still laughing her head off. Dash wiped a tear from her eye and worked to gain control of her laughter. “Okay, okay, I’ll stop.” Rarity didn’t seem entirely convinced by Rainbow’s words, but she returned to her search for the fabric all the same. That left Spike and Rainbow Dash alone again, and for a time the pair kept to themselves. Dash snickered under her breath while Spike nervously held his tail. “What’s a seance?” Spike asked, not liking the sound of that word. “I don’t know, Dashie, it sure sounds like Spike’s really freaked out about this,” Pinkie Pie commented as she bounced alongside Dash, the pair making their way towards the library. It was a few hours after sunset. The Ponyville streetlamps were lit, and the two mares were some of the few ponies still outside. “Just as soon as Spike lets us in,” Rainbow assured her. The rendezvous point was across the street from the library, and after standing there for a few minutes they saw the library’s front door open. Spike stood in the doorway and, after glancing around to make sure the coast was clear, waved the pair of mares inside. “Are you sure this is going to work?” Spike asked once Rainbow Dash and Pinkie Pie were in the library and he had shut the door. “This is how we’re going to talk to the ghost,” Rainbow Dash answered as she waved a hoof over the item. It was like a large board game, but instead of having colorful squares it was a plain brown color with a bunch of black letters on it. There was also a wooden pointer with a thin glass lens sitting on top of the board. “It’s called a phantom speller,” Dash explained while she turned down the room’s lights and placed a few candles near the letter covered board. Once lit, the candles created a small pocket of light around the board while casting harsh shadows across the library walls. It was a creepy effect that Rainbow Dash had crafted, and she couldn’t help but smile at her work before taking a seat beside the phantom speller. “H-how does it work?” asked Spike. “No Spike, we’re not moving it,” Pinkie Pie answered. “But that means...” Spike began before trailing off and looking nervously at the board. He, Pinkie Pie and Rainbow Dash all watched as the pointer continued to creep across the board until it finally came to a stop. Through the magnifying glass embedded inside the pointer, the trio could clearly see one of the few words printed on the board. Spike took his claw off the pointer. “Okay... you know what, I don’t think this is a good idea.” He tried to get up from his seat, but Rainbow Dash used a hoof to push him back down. “Then you have to stay here and help us. We can’t figure out how to make it go away unless we talk to it,” Rainbow Dash explained while motioning for Spike to put his claw back on the board. It was obvious Spike didn’t like the idea of talking with the ghost, but the prospect of being able to make it go away was tempting. In the end, Spike put his claw back on the pointer. 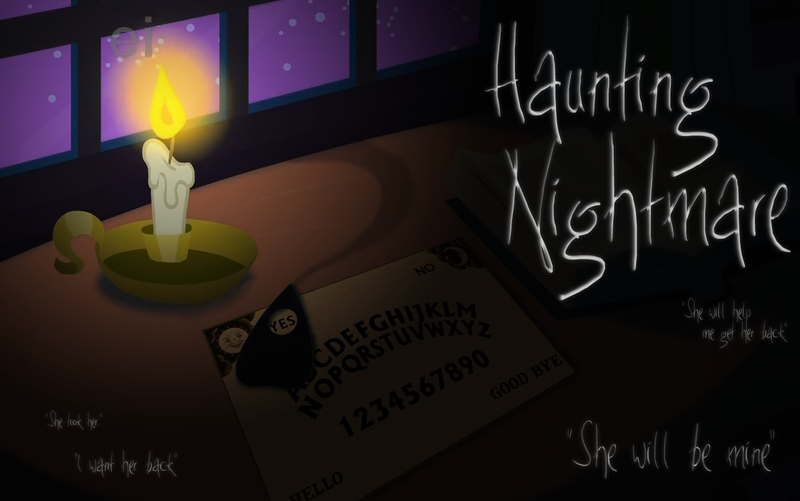 “Okay, next question: are you a spirit?” Rainbow Dash asked, calling out with a spooky waver in her voice. This time, the board didn’t take as long to reply, the pointer crossing over to the board’s adjacent corner. In response to the question, the pointer moved down from the corners of the board. It slid about the letters laid out in the center, pausing above specific characters as it spelled out a response. “Whatismine?” Pinkie Pie echoed, tilting her head in confusion. “Nothing,” Pinkie Pie mouthed back. It only took a moment for the pointer to start moving again, sliding back across board. The group split in two. Spike crept up stairs to go to the bathroom while Rainbow Dash dragged Pinkie Pie into the kitchen. Once there, Rainbow Dash shut the door and turned to glare at Pinkie. “What are you doing? This isn’t what we rehearsed,” Rainbow Dash snapped, trying to keep her voice down so they wouldn’t run the risk of waking Twilight. “Me!? What are you doing? You’re the one moving the pointer!” Pinkie Pie accused. “Pinkie Pie, I swear, it’s not me,” Rainbow Dash assured her. “But... ” Rainbow Dash tried to protest. “Great! Let’s get back out there before it leaves,” Pinkie Pie said excitedly before bouncing out of the kitchen and returning to her place beside the phantom speller. Rainbow Dash wasn’t as eager. She lingered in the kitchen a moment to take a deep breath. She then flared her wings, put on an air of courage, and strode out into the main room before sitting back down beside the phantom speller. Spike came back from the bathroom a few minutes after the two mares had returned to the board. His face was dripping with water, but he acted as if nothing was amiss. He simply sat down. Even as water dripped to the floor, neither Pinkie Pie nor Rainbow Dash pushed for answers. Instead, the trio turned their attention back to the Phantom Spell and replaced their hooves and claw on the pointer. For a few moments the pointer remained still, like the spirit had left, but then the pointer twitched once. That twitch was followed by movement as the pointer crossed to the upper right corner of the board. “Oh, who was it?” Pinkie Pie chirped all too eagerly. The pointer began its reply as soon the question had left her lips. It spelled out the spirit’s answer while she, Rainbow Dash, and Spike leaned in to watch with anticipation. Each worked mentally to keep track of the motion. Rainbow Dash even mouthed the letters to herself. “Uh, Pinkie Pie, maybe we should-” Dash tried to interrupted, but Pinkie was too intently focused on the board to hear her. “Oh come on, won’t you please tell me who she is? Pretty please with sugar on top?” Pinkie Pie sang, as if asking nicely would entice the spirit to give up the truth. Dash abruptly took her hoof off the pointer and stood up from the board. “Whoa... okay, would you look at the time? I got someplace to be. So... ya, see you two later.” With that Rainbow Dash quickly made her way to the library door, only for Pinkie Pie to speed ahead and block the exit. “In the middle of the night?” Pinkie Pie questioned. “Uh... yeah, in the... middle of the night,” Rainbow Dash assured Pinkie with a weak smile. “Uh, girls?” Spike tried to interrupt to no avail. “I told you, I’m not scared!” Rainbow Dash snapped. “But then whey do you want to leave so bad? “Girls!” Spike shouted. He had gotten up from the board and walked over to where the two mares were arguing, ensuring he was heard. “What is it?” Dash asked, obviously wanting to get back to her argument with Pinkie Pie. The two mares turned their heads, and saw that Spike was telling the truth. The pointer was still moving, sliding between letters even though there was no pony or dragon touching it. For almost a minute none of them approached the phantom speller. They remained rooted to the floor, watching the pointer slide from a distance. The first one to shore up enough courage to move closer was Pinkie Pie, though the expression on her face made it clear that she wasn’t enjoying the ghostly encounter any more. Pinkie’s courage let Rainbow Dash and Spike approach the board as well. The pair followed behind Pinkie until all three of them were close enough to read what the pointer was spelling out. The pointer came to an abrupt stop, leaving the last letter magnified in its lens as the room fell into an uneasy silence. Rainbow Dash, Pinkie Pie, and Spike all stood, eyes locked on the phantom speller. None of them dared to move or even breath as the watched and waited to see if the spirit would continue to speak. “Is... is it gone?” Spike asked quietly several tense moments later. Pinkie Pie, Rainbow Dash, and Spike all jumped and screamed at the top of their lungs. Spike bolted to hide under the library’s reading table while Pinkie Pie and Rainbow Dash hugged each other for dear life. It was then the lights around the room came on, magically lit by a very angry and tired Twilight who glared at her friends from the base of the staircase. “Spike, I told you, there are no such thing as ghosts,” Twilight lectured. “So it was Rainbow Dash,” Twilight grumbled as she turned her glare on Rainbow, who put up a hoof defensively. “Ha! See, Spike? These two were just playing a trick!” Twilight said while pointing an accusing hoof. “But-” Pinkie Pie tried to protest only for Twilight to cut her off. “But Twilight, there really is something-” Rainbow Dash tried to stress, but Twilight didn’t give her a chance to finish. With her horn glowing, she opened the library door and pointed at it with a hoof. “But Twilight,” Pinkie Pie and Rainbow Dash said in unison, only to fall silent at the stern, unforgiving glare in Twilight’s eyes. Unable to face their friend’s gaze, Rainbow and Pinkie made a quick retreat, running out of the library and to the street outside. “Good night!” were the final words Twilight yelled to her friends before she slammed the library door shut and set the locks. She then released a tense breath before shelving her anger and looking down at Spike. He clung tightly to her leg, looking around the room with wide, terrified eyes. Spike nodded, but remained standing where he was for a moment, staring at the place where the phantom speller had been. He tried to remember if he had seen Rainbow Dash grab the board when she left, but he couldn’t recall seeing it in her hooves. Still, something like that couldn’t just up and vanish... could it? “Thanks again for helping out, Applejack,” Twilight said with a weary smile. She stood on the porch of the Apple family farmhouse, unloading several items from her saddlebags and setting them just in the door. The sun was setting in the distance, just minutes from disappearing completely. “Did you try tellin’ him there’s no such thing as ghosts?” asked Applejack. “Good. Maybe that will teach them it isn’t a good idea to scare your friends so badly,” Twilight seethed coldly. “All right, see you tomorrow then, Sugarcube,” Applejack said, waving goodbye to Twilight. She remained on the farmhouse’s front porch, watching Twilight until she had reached the farm’s front gate. Once Twilight had turned and started heading in the direction of Ponyville, Applejack slipped inside the farmhouse to help Spike get settled in. There was a deep frown on Twilight’s face as she tapped on her bedroom window for what was the third time that evening. Since her return from Sweet Apple Acres a few hours before, Twilight had been trying to read her book on illusions spells. She blazed through the first chapter without any trouble at all. Yet, upon trying to start the second chapter, Twilight found herself unable to concentrate. She began feeling a draft: a cold chill on one side of her body. Now, feeling a draft in the library was no strange occurrence, and Twilight had a properly prepared checklist for taking care of a draft whenever she felt one. And she went down that checklist almost an hour and a half ago. First, she made sure all the windows were closed. Then, she placed a quick charm on the windows so they were better insulated. Then, as a final touch, she started a small fire in the fireplace. She hit every point on her checklist, and as expected she couldn’t feel the draft anymore and was able to return to her reading. At least until the draft decided to return. Just as Twilight reached the bottom of the page she was on, the right side of her body was cold again, and it baffled her. She had gone down her checklist. She hit every point. There was no possible way she could still be feeling a draft. Yet the cold sensation on Twilight’s right side was evidence to the contrary. So Twilight went down the checklist again. She checked and enchanted the windows before throwing a fresh log into the fireplace. She stayed close to the fireplace, soaking in the heat from the flames until the cold sensation was gone. For a second time, Twilight was sure the draft was defeated, but the moment she tried to go back to her reading the chill returned. Mind flaring with determination, Twilight embarked on a crusade to defeat the strange draft that kept her from reading. She triple checked the windows, checked to make sure the draft wasn’t coming from the front door, and, as a final touch, took her book off her reading desk and brought it over beside the fireplace. She laid down with her right side facing the flames, smiling smugly at the room as if daring it to try and make her feel cold again. It was a dare the library accepted. The moment Twilight returned to her reading a chill crawled up her spine. Her right side was cold again. “Oh for Celestia’s sake!” Twilight bellowed out in aggravation as she jumped to her hooves and stomped upstairs. She didn’t know what was going on or where that draft was coming from, but she wasn’t going to let it keep her from her studies any longer. With a violent tug, Twilight took the blanket off her bed and draped it across her back. She then stomped back downstairs, laid back down by the fire, and wrapped the blanket around her body as tightly as she could. “There; now there’s no way I can be cold,” Twilight stated firmly, every part of her body, except her horn and eyes, cocooned in her blanket. Still, instead of going straight back to her reading, Twilight decided to sit and wait for a minute and see if the draft returned. When it didn’t, Twilight let herself smile and revel in her triumph over the draft as she levitated up her book, intent on picking up where she had left off. Twilight blinked, closing the book and checking the cover. It was not her book on illusion magic. Instead, Twilight found herself holding a book about Equestria’s history: the same book where she had first read about Nightmare Moon and the Elements of Harmony. Twilight cocked an eyebrow in confusion and tossed back the part of the blanket wrapped around her head. “Where did this come from?” she asked herself as she cracked open the book again. She quickly flipped back to the passage where she had been, her eyes focusing on the two illustrations that were visible to her. The one on the left was a depiction of Luna and Celestia standing on a pair of clouds, Luna’s head turned away from Celestia. The image on the right side page was of Nightmare Moon, rearing back in a frightful pose. Twilight turned her head abruptly and glanced around while her ears swiveled forward. She then shut her book and stood up, keeping the blanket wrapped tightly around her body as she took a few steps away from the fireplace. “Hello, is somepony there?” Twilight called out to the empty library. She strained her ears listening for the slightest whisper of a reply. The silence, however, persisted. The only thing that Twilight heard was the sound of her own breathing mixed with the crackling of the fireplace. Twilight stopped, her voice falling silent and her eyes focusing on the section of the floor where she left the book. It had disappeared, and in its place was a letter covered board with a pointer: a phantom speller. A shiver ran down Twilight’s spine and she grappled with the fear that was growing in her chest. She didn’t own a phantom speller; it was just a silly board game with no foundation in real magic. Yet, as Twilight approached the board, she couldn’t deny that it was there. She even reached out a hoof and touched it, proving to herself that it was physical and real. Inching closer, Twilight craned her neck over the board and focused on the pointer. It was positioned over the upper left hoof corner of the board, the small embedded glass lens directly above the word “Yes”. The sight of that word magnified in the pointer’s lens made Twilight feel uneasy, and she retreated from the board. She then took in a deep breath and shook her head. Upon saying her explanation out loud, Twilight realized how far-fetched it sounded. She, however, forced herself to ignore the weaknesses in the argument. She walked back up to the phantom speller, and without giving the board or its pointer a second look, put it in a drawer. It took some time, but Twilight was able to find her book on illusion spells and return to her place by the fireplace. Yet, as Twilight tried to focus on her reading, she found the silence of the library had become uncomfortable. It was just too quiet, and the strange happenings of the evening were still lingering on the edges of her thoughts. Despite her every desire to keep reading, Twilight could tell her efforts that evening would be fruitless. She heaved a sigh of defeat, and after tossing the book onto her reading desk, retreated upstairs to the bedroom. She shut off the lights, laid down in her bed, and grumbled under her breath as she closed her eyes for the night. Twilight stumbled into her bathroom the next morning, heavy bags under her eyes. Her body was on autopilot, going through the motions of her morning routine with very little guidance. Into the bathroom, turn on the light, start the shower, wait for shower to warm up, adjust temperature, and finally climb in. The water helped to drive away the clinging haze that consumed Twilight’s mind, but could not clear it away completely. She had only been able to scrape together two hours of decent sleep during the night, and blamed her imagination. As she laid in bed, trying to sleep, she kept opening her eyes and looking out into the darkness of the bedroom. She couldn’t shake the feeling she was being watched. She even tried sleeping with a light on, something she hadn’t done since she was a filly, but it didn’t help. Lifting a hoof to her mouth, Twilight covered a yawn before going about the process of scrubbing her coat, mane, and tail clean. It was a routine she usually did with a rote efficiency, since she had other things she wanted to get done in the morning. This morning, however, she allowed herself the small luxury of just enjoying the warm shower. It also gave her more time to wake up and scrape together what little energy she had gained from her few hours of sleep. Twilight stayed in the shower until the hot water was about to run out, only shutting the faucets off when she felt the water beginning to cool. She then remained in the tub for a while, letting herself air dry before she climbed out to finish the process with a towel. Her long time in the shower left the room choked with warm steam, which Twilight didn’t bother trying to vent as she cast a spell on her mirror. She warmed up the glass, evaporating the fog that had condensed on its surface as she wrapped her towel around her head in a bun. Then, once the mirror was clear, Twilight levitated her toothbrush and applied a carefully measured portion of toothpaste to the bristles before beginning to brush her teeth. Something moved in the mirror behind her. Twilight tensed and held the toothbrush still in her foamed mouth. She leaned in to the reflective surface, inspecting the image as she tried to discern the source of the movement. It was the steam in the room. The mist behind her was still twisting, though it had lost much of its momentum. Twilight turned and stared at the steam directly for a time before a small smile formed on her lips. She gave her tail a small flick, and set the mist swirling again. Satisfied she had solved the mystery of the swirling steam, Twilight resumed brushing her teeth. She scrubbed each tooth with due diligence, and then set her toothbrush down. She sipped some water from the faucet, gargled, and rinsed before looking at her reflection to make sure she hadn’t missed anything. The glance turned into panic. Twilight stumbled away from the mirror and ended up falling back into the empty bathtub with a loud thud. The fall left her head spinning. She laid belly up in the tub, and once her head had cleared, she righted herself as fast as her hooves would allow and stared at the mirror. Twilight took several deep breaths, trying to calm her now racing heart. She had seen something, though she wasn’t sure what it was. A shadow, a silhouette... whatever it was, the simple sight of it had scared her witless. As she regained her composure, Twilight cursed herself and climbed out of the tub. It was that same unfounded fear that had kept her up all night and she was tired of dealing with it. There was nothing in the mirror and there hadn’t been anything there. She was just imagining things. Turning on the sink, Twilight rinsed her mouth of the lingering toothpaste foam and then stomped out of the bathroom, sweeping a good portion of the shower steam into the bedroom with her. Without pausing a moment, she grabbed up her to do list and saddlebags before heading down the library stairs, fully intent on distracting herself from her foalish fears by diving right into her day’s tasks. “There are no such things as ghosts!” Twilight lectured herself as she slammed the bedroom door shut and stomped down the stairs. She left the bedroom utterly empty except for the steam, which continued to drift out of the bathroom: steam that swirled, as if nudged by something. Spike groaned, turned over, and forced his eyes shut. He laid on the porch swing of the Sweet Apple Acres’ farmhouse, resting his head on a pillow as he made a fresh attempt at getting some sleep. The swing gently rocked back and forth, driven by Granny Smith, who was sitting nearby, looking out across the farm with a pleasant, relaxed smile on her face. It was late afternoon, about the time Ponyville started shutting down and ponies began leaving work to return to their homes and families. “You know, you should stop tossin’ and turnin’ and just get some rest,” Granny Smith lectured without taking her eyes off the distant horizon. Spike groaned, covering his head with a pillow as braced himself for what he sensed was going to be a long, rambling speech about how things used to be. “Nope, I had to work for my supper, not like some of the other ponies in town. Like Applejack’s friend, Rainbow Dash. She’s supposed to be our town’s weathermare, but she spends half her time napping or practicing her tricks. I say, if she has that much free time, she should find a way to be more productive. Celestia knows we could use the help on the farm. “No,” Spike moaned from beneath his pillow. “Where is Third Eye? Does he still live in Ponyville?” Spike asked as he stood and stepped towards the elderly mare. “I’m going to go to the mayor’s office and ask them where Third Eye lives,” Spike answered. “But Twilight-” Spike tried to protest. “But what about Twilight? She’s been all alone in the library with the ghost! What if it’s done something to her?” Spike asked, only for Granny Smith to nudge him in the side and direct him towards the farmhouse door. Twilight wore a smile on her face as she yawned and slipped into bed. It had been a good day. She had gotten everything done on her checklist and only thought about ghosts once, and that was when she was helping Pinkie Pie hang some fake ghosts outside of Sugarcube Corner for Nightmare Night. Yes, a totally normal day that helped clear away all of the crazy paranoia she had been experiencing the night before. It had been a good day, but a long one as well and Twilight was dog tired. She couldn’t help but yawn again as she turned over in her bed and looked out the window at the moon. Her eyes began to slide shut, and soon she drifted off into a blissful and well-earned rest. Twilight slowly opened her eyes, blinking a few times to bring the world into focus. It was dark, the only light coming from the moon and stars outside the window. She didn’t quite understand why she was awake; it was past midnight and sunrise wouldn’t be for about six hours. Still, she just shrugged it off and snuggled back into her pillow, fully intent on getting back to sleep. Twilight sat up in bed, ears swiveling forward as she listened for the sound. It was a familiar sound, but she couldn’t place it and was about to lay back down when the noise repeated for a fifth and sixth time. It was enough for her to get a bearing on where the sound was coming from; it was originating from the library’s main floor. After getting out of bed, Twilight made her way downstairs. She didn’t bother trying to light any of the library’s lamps or candles, instead using her horn to light the way. She reached the ground floor without any difficulties, and began sweeping the beam of light from her horn across the room as she searched for the source of the noise. The sound repeated itself again, and with its help Twilight was able to zero in on the source. Her light fell on the door to the library’s basement, just beyond which she saw her Smartypants doll sitting on the floor. She had gotten the doll back from Big Macintosh a few days after the commotion she caused, following an awkward and overly personal conversation she would have rather avoided. Still, that wasn’t really important at the moment. What puzzled Twilight was how Smartypants had gotten out. She usually kept her tucked away in the bedroom, and she couldn’t recall taking Smartypants out since the incident with the “Want it, Need it” spell. “What are you doing there?” Twilight asked the doll as she trotted towards it. The doll, of course, offered no reply, just lying on the floor as Twilight moved past the basement door and stood over it. She reached out a hoof and gently put it down on the doll, causing it to let out the squeaking noise she had been hearing from upstairs. Twilight jumped and spun around, dropping Smartypants as she moved to the now shut basement door. She tried to push it open, both with her body and magic, but it remained tightly shut. There was no lock on the door; there was no way it could stay closed unless somepony was holding it shut from the other side, and yet she could not get the door to budge. Twilight froze up as a shiver crawled up her spine. She turned slowly, refocusing the light from her horn on the patch of floor where she had dropped Smartypants. The toy was gone, and another squeak filled the air. She could tell it was coming from the pitch black basement below. Unable to get out the door, Twilight swallowed nervously and made her way across the landing to the stairs. She went down a single step at a time as she strained her eyes and focused her magic, trying to pierce the darkness. The shadows around the room proved uncommonly persistent, but she pushed forward to reach the bottom steps before walking to the center of the basement. She found Smartypants again. The toy was sitting upright in the center of the floor. She approached it, and was calling on her magic to pick it up when she felt a draft on the back of her neck, as if something with an icy breath had exhaled on her. Twilight spun and looked around frantically, flashing the light from her horn around the room. She couldn’t see anything, but that didn’t stop the growing panic in her chest. Her mind was flashing back to the events of that morning and the night before, and as those memories bubbled to the surface Twilight did the only thing she could. She began to chant to herself, a panicked chant to try and drive away her fear. Twilight’s chant came to an abrupt end as she felt the cold draft on her neck again. The air felt wrong in so many ways. With a panicked yelp Twilight bolted for the stairs, galloping up them at full force while her horn began to glow. She was on a collision course with the still blocked door, but just as she was about to crash she called on her magic. In a single bright flash, she teleported up to the bedroom. Terror gripped at Twilight’s chest. The squeak had come from Smartypants. Twilight could clearly remember leaving the doll in the basement, yet it sounded as if the squeaking was coming from right on the other side of the bedroom door. Over and over, something made Smartypants squeak. Twilight, however, didn’t dare leave her bedroom a second time. She stayed right there, under the covers with the door barricaded and lights on. She would remain there for the entire night. Sleep, however, was something Twilight couldn’t risk. She was too scared and it was too dangerous to go to sleep. Even if it was safe to rest, the squeaking from Smartypants wouldn’t have allowed her. Over and over the toy squeaked, persisting at a constant pace with the reliability of a finely tuned clock and tormenting Twilight for hours. It only stopped once the sun had begun to rise. Twilight nodded her head firmly, holding out Smartypants. As soon as she had been able to round up enough courage to leave her bedroom that morning, Twilight had grabbed Smartypants and bolted out the door. She then ran at a full sprint across Ponyville to Carousal Boutique, arriving just as Rarity was opening her shop for the day. Twilight glanced at her reflection in one of the many mirrors located in the boutique’s front room, agreeing with Rarity that she didn’t look her best. She had left the library without taking a shower or brushing herself, so her mane, tail, and coat were a mess. The bags under her eyes also made it apparent that she hadn’t been able to get as much sleep as she would have liked the night before. With fine dexterity earned over her years of dress making, Rarity began the impromptu doll surgery. She began by removing the doll’s blue, polka dotted shorts and turning the doll over several times. The seamstress was examining every part of the doll, looking at every visible seam before finding the one she was searching for. Since dolls need to be stuffed before they are finished, there was always one seam someplace that was more exposed than the others. Rarity eventually found that seam on the doll’s right side. With delicate precision, she cut the seam open and exposed the doll’s aged stuffing, which had been stained and discolored by years of love and affection from its owner. “Give it!” Twilight snapped as she snatched the squeaker out of Rarity’s magic and threw it on the floor. She then proceeded to cast a number of spells on the squeaker, her horn flashing brightly several times while Rarity looked on, both insulted Twilight had snatched the squeaker away so rudely and yet curious whether or not Twilight would find anything wrong with the noise making device. “No... that, that’s impossible!” Twilight exclaimed as she shied back from the squeaker after casting her twenty third magic detection spell. Rarity blinked a few times as she looked around the now empty room. Twilight had left without saying a word. “Tell me why I’m flying you to Graintan again?” Rainbow Dash asked as she looked over her shoulder. She soared over rolling hills outside of Ponyville, following a dirt road as it wound its way west. Spike’s protests fell on deaf ears as Rainbow Dash circled once and then spirited forward, zipping through the air with her renowned speed. She bolted across the sky in the direction of Graintan, with Spike holding on for dear life. “You sure this is the place?” Rainbow Dash asked as she and Spike stood next to one another on a dirt road. They were just outside the town limits of Graintan, surrounded on all sides by waving fields of grain. Directly in front of them stood a farmhouse, smaller than Applejack’s home and also in a worse state of repair. There were shingles missing from the roof, and the grass out front had been allowed to grow wild. It was nothing a good weekend of work couldn’t fix, but it gave the home an ominous appearance. “Yep, this is the right address,” Spike confirmed as he looked at the note he had scrawled in the palm of his claw. “Sure is creepy enough to be a house for a pony that deals with ghosts,” Rainbow Dash commented as she and Spike made their way to the front door, her eyes drifting around the unkempt property while Spike remained focused on the door ahead. After climbing onto the house’s small front porch, Spike knocked on the door. His knocks were answered within moments. The door jerked open a crack, and through the small opening a dull green, panicked eye peered out at them. “You’re not dead,” an aged voice from behind the door accused. “No, we need to talk to you about a ghost that’s haunting the Ponyville Library,” Spike explained. He took a step towards the cracked open door only to have it slammed in his face. Again, the front door of the house slammed shut. That loud slam was followed by the sound of a pony undoing chains and locks from the far side. The door then flashed as a spell was lifted off its wood before swinging open to reveal a dull, tombstone gray unicorn stallion. His cutie mark was purple lines in the shape of an eye inscribed within a triangle. The stallion anxiously leaned forward and looked intently at Spike and Rainbow Dash, revealing his thinning mane. His tail, which was the same stringy silver color of his remaining mane, twitched anxiously, and the frown of his lips only worsened his wrinkles, which made it clear he was as old as Granny Smith. “With wha-” Rainbow Dash tried to ask, only to be cut off as Third Eye jumped back into his house with a panicked look on his face. His horn glowed, and before Spike and Rainbow Dash could react they were dragged into the house. “No, not yet. We can’t talk yet. House must be secure before we can talk,” Third Eye muttered to himself. He returned to the door, shutting it with a slam and putting a dozen locks and chains in place. He then touched his horn to the door, causing the wood to flash with a pale white tone. “Safe from what?” Rainbow Dash asked once she and Spike were released from the levitation magic. “The nightmare... the nightmare that’s touched you, that’s been near you. The nightmare that’s after me. But no... that’s impossible. The library is safe. I made sure it was safe. If... if it’s not safe, then there is a chance-” Third Eye fell silent and his pupil’s narrowed. He bolted into the old home’s living room, and began shoving furniture against the walls. Spike and Rainbow Dash stood back and watched as Third Eye moved one final piece of furniture. He then levitated the large rug in the center of the floor off to one side and started pacing in a circle around the now exposed boards. “What... is he doing?” Spike asked. “What... what is that?” Rainbow Dash asked as she and Spike approached the glowing drawing. Before her hoof could come in contact with the glowing lines, Third Eye tackled Rainbow Dash. The pair rolled across the floor and crashed into the far wall with a resounding thud. “Do not touch it!” Third Eye ordered. He wrestled vigorously with the pegasus for a brief moment, but his age caught up and he soon fell off her with a wheeze. “No, Rainbow Dash, we need his help,” Spike said as he put himself between the two ponies. “What ward in the basement?” Spike asked. “Wait, Spike, you remember Pinkie Pie’s ‘Welcome to the Season Party’?” Rainbow Dash asked, her anger at Third Eye replaced by concern. “Yeah, what about it?” Spike asked. “The lights were only out for a few seconds, and then they came back on all on their own,” Spike answered. “So do you believe us now, that there’s a ghost in the library?” Rainbow Dash questioned, struggling to follow Third Eye’s ramblings. Spike ended the explanation several minutes later. The group had moved to Third Eye’s kitchen. The stallion had become calmer and less nervous, though he still sporadically twitched and looked about, as if fearful something was about to jump out at him. Still, he was focusing, speaking more slowly as he thought about what he had just been told. “What do you think it means?” Spike asked anxiously, getting chills as he remembered seeing the those words being spelled out on the phantom speller. “So, wait a minute. Is Twilight the her or the she?” Rainbow Dash asked, drawing Third Eye out of his thoughts. “But what about Twilight! ?” asked Spike. “Why would that make a difference?” Rainbow Dash asked, only for Third Eye to shrug in reply. “And just where are we supposed to stay until morning?” Rainbow Dash asked. Twilight flinched as she looked up from her book, breathing anxiously as she surveyed the bedroom. She wasn’t sure if she had just heard something or not, but after seeing that the room was empty, she forced herself to go back to her reading. Glancing out the window, Twilight saw that night had fallen. She yawned, exhausted by a long day and her lack of sleep the night before. She wanted nothing more than to go to sleep, but she had to remain awake. Her bed was piled with books, and she was reading as fast as her eyes would allow. After leaving the Carousal Boutique, Twilight had gone straight back to the library and pulled every book she could find on spirits, ghosts, and the paranormal. It was actually surprising how many books the library had on the subject, and most of them were tucked away on a specific shelf in the basement. She had been reading since then, reading every page she could lay her eyes on... and through all her reading Twilight had come to a startling conclusion. Ghosts were real, and her library was haunted. Still, with that admission came resolve. While she had yet to find specific instructions, scrawled notes in the margins of the book seemed to indicate that there were ways to fight back against ghosts and other paranormal things. There was a way to fight back, she just had to find it. Another sound made Twilight look up from her feverish reading, but this time it wasn’t a thump or some other sound she hadn’t been able to pinpoint. This time it was the library’s clock announcing the hour. It was midnight, and sunrise wasn’t for several more hours. She felt her heart sink at the prospect of having to remain awake all night, but she wouldn’t stop. This was her library, and she wasn’t going to let a ghost chase her out. She was close to an answer, and once she had it she would use her magic to make the ghost leave. All she had to do was keep studying and find the solution. Yet, through the haze of her worry and exhaustion, Twilight found herself focusing on the clock. She counted off each chime, finding her mind calmed by the reliable, rhythmic tones. Twilight perked her ears up, straining to hear the final chime. The library had fallen into an uncomfortable silence, one that sent a shiver down her spine. She knew she hadn’t missed a chime; she had counted each one. Twilight sat up in her bed and levitated the nearby candle into the air, holding it high as she looked around. It was coming; she knew it was coming, but how would it come? It had burned her mouth with oatmeal, sent a chill down her spine, and taunted her with Smartypants. It had never done the same thing twice, so what was the ghost going to do? Waving the candle around, Twilight began to jump at shadows. Everything in the room became suspect; the ghost could use anything. The books could start falling off the shelves on their own. The window could open. The paranormal books she had managed to read had made it clear that ghosts could affect anything physically. Still, as Twilight looked about nothing seemed out of place. Everything was normal, and for a moment she tried to calm herself down. Maybe... maybe she had just miscounted, missed one of the clock’s chimes. It was entirely possible; between being scared witless and her lack of sleep, Twilight knew she wasn’t at the top of her game. Twilight froze, not daring to open her eyes. She wasn’t sure if she had actually heard something or if it was her imagination playing tricks on her, but for a moment she just listened. Only when she was sure she didn’t hear anything else did she dare open her eyes and look to see what had caused the noise. It was a book, a single book laying open on the floor. Twilight couldn’t clearly see the words from where she was, but she could make out the pictures on the book’s exposed pages. Forcing down a swallow, Twilight gathered up the faint traces of courage she had remaining and climbed down from her bed. She picked up the candle from her bedside table, and very cautiously approached the book. Inch by inch she got closer, and as she did she began to recognize the pictures on the page. One was of Celestia and Luna, standing together on clouds with Luna turned away. The other was of Nightmare Moon, rearing back in a frightful pose. But there was something else about the pages: they had been torn. Something had shredded the text beneath the pictures, and for a moment Twilight’s concern over her books overpowered her fear. She closed the distance between her and the book in a few steps, picking it up as she began to inspect the damage to the pages. It was like the book had been shredded by claws. The words and most of the illustrations were destroyed. The only pictures that had survived were the ones of Luna and Nightmare Moon. Twilight closed the book and looked on the cover. It was also shredded, and jagged letters had been clawed into the book’s cover. An unworldly scream erupted in the air. It shattered the silence of the library, and sounded like it was coming from all around. It painfully grated on the ears, and smashed every thought in Twilight’s mind. The scream was followed by a stomping on the library’s staircase. Something was coming upstairs, and it was coming quickly. Twilight did the only thing she could think of: run! She bolted for the bathroom, leaping inside with her candle and slamming the door shut. Normally, the bathroom door didn’t have a lock, but in a rush of adrenaline and fear, Twilight called on her magic and transformed the door handle into a heavy bolt lock. Just as something threw itself against the door, she clicked the latch shut. Again and again something large and heavy slammed against the door. The ghost was trying to break in, and Twilight was in a panic. She climbed into the bathtub and drew the shower curtains shut, curling around the small flickering flame of her candle as she shut her eyes. Tears streamed down her face, but Twilight kept a hoof over her mouth to muffle her crying. She was trapped; trapped in her own home. Her only hope of escape was her teleportation spell, but each time she attempted it, her concentration was ruined by whatever was slamming against the door. Tears began to stream down Twilight’s face. Already, her mind was filling with horrible thoughts of just what would happen if the ghost got in. Would it devour her, attack her, or do something worse? She couldn’t even imagine anything else as the dreadful pounding of the door continued. Each slam shattered her thoughts like fragile glass. She couldn’t get away. She could only hide until morning and hope that the ghost couldn’t break through the door. Then the pounding stopped, and for several minutes the only sound Twilight could hear was her own muffled whimpering. She didn’t dare believe that the ghost was gone. She knew it was still out there, someplace in the library, but now that it wasn’t pounding on the door she was able to calm herself down a little and catch her breath. Looking in the candle’s flame, Twilight tried to focus in on its gentle flickering light. It brought some peace to her mind, but only enough to make Twilight realize she couldn’t stay in the library. She had to escape. The ghost had never haunted her outside the library. If she could get outside, then she could get someplace safe and get help. She could go to Applejack or Rarity for help, or maybe even go straight to Canterlot. If anypony could protect her from a ghost, surely Princess Celestia could. But she had to get outside the library first. Maybe... maybe she could manage to teleport herself that far. The shorter the distance, the less magic and concentration her spell took. Yes, she could just teleport to the street outside the library. Then, she could gallop away and get help. Struggling to her hooves, Twilight forcibly calmed her breathing as she set the candle down in the bathtub. Her knees were shaking and she felt nauseous from her fear, but Twilight made herself focus. She called on her magic, and after sucking in a deep breath Twilight unleashed the spell. It was over in a second, and Twilight knew immediately it had worked. She could feel the dirt of the road beneath her hooves and the cool night air on her coat. She opened her eyes and looked up at the nighttime sky. The glittering stars never looked as beautiful to Twilight as they did at that moment. She then looked back, letting a wisp of a triumphant smile form on her lips as she looked over the darkened library. She had teleported to the exact place she wanted to be; she had escaped. The nightmare proved Twilight wrong. The library door swung open violently, slamming against the bookcases inside. Then, before she could take a single step, something grabbed one of her hind hooves and pulled her to the ground. “NO!” Twilight screamed as she was dragged backwards. She scrambled, kicking her hind legs as her forelegs struggled to get a grip on the loose dirt. When that didn’t help, she looked to see the library’s dark entryway yawning wider, like some mouth about to swallow her. “NO! Let me go! Let me go! Help! Somepony HELP!” Twilight cried out desperately, but there was nopony around to hear her. She continued to scream and claw at the ground as she was dragged inch by inch towards the library door. Then, once she was actually inside, the door slammed shut. Twilight’s final screams echoed through the streets. The library’s dark windows revealed nothing. Only one light remained, a single candle that continued to flicker from its place in the bathtub. Then, even that light was extinguished, leaving the entire library consumed in darkness. Rarity looked at the Nightmare Night decorations spread all down the street, and cursed herself for her procrastination. Nightmare Night was tomorrow evening, meaning she only had the rest of that day and the next to finish her costume. She should have been done already, but so much had gotten in the way. Customers came in wanting last minute adjustments to their costumes, and then Opal went and shredded part of Sweetie Belle’s vampire cape. It took Rarity time to remake it, and while she was happy to do it for her little sister, that was time Rarity didn’t really have to spare. That and, after Twilight’s abrupt departure, Rarity hadn’t been able to properly concentrate on her work. Twilight looked so scared, and she had left her Smartypants doll behind with its squeaker lying in the middle of the floor. The fact Twilight kept the toy past fillyhood spoke to how much she cared for it, and Rarity doubted her friend would just abandon the doll at the boutique so heartlessly, had not something terrified her into fleeing. So, in hopes of cheering Twilight up and easing her own concerns, Rarity decided to dip into her dwindling supply of time and fix Smartypants. She secured its loose eye, replaced all the old stuffing, and gave the doll a good washing. Smartypants was still old and well loved, but it looked as good as it possibly could, all things considered. Nearing the library, Rarity levitated the doll out of her saddlebags and carefully adjusted the yarn that made up the fake mane before stepping onto the front step. She gave the door a few firm knocks, and didn’t have to wait long for the door to open. “Oh, Twilight, you’re looking...” Rarity’s voice trailed off and she stared at the pony who answered the library’s door. Twilight was looked worse than she did the day before. Her mane was still a mess, as was her coat, but on top of that her eyes were distant and her belly was dusty. It was like she had been rolling around in the street. Twilight’s gaze did not shift at all. Her expression and eyes remained hollow. She just stared at Rarity. She did not smile, did not frown, didn’t do anything; she just stared. Rarity forced a laugh to disrupt the uneasy silence, and held Smartypants a little closer to Twilight. This forced her to take notice of the doll. She took it with her magic and placed it just inside the door. “Thank you,” Twilight said mechanically. She turned her gaze back to Rarity, sending a shiver up her spine. “I’m studying,” Twilight answered as she took a step back and placed her hoof on the door, preparing to close it. If Rarity had been any slower pulling her hoof away, it would have been crushed. Twilight, with that one guttural shout, slammed the library door shut. Normally, Rarity wasn’t one to suffer silently when a pony was so blatantly disrespectful, but she was unable to find her voice. Her heart was racing and her knees were weak. In that brief moment, Twilight was one most frightening thing Rarity had ever seen, right up beside Nightmare Moon and Discord. “W-what’s gotten into her?” Rarity asked herself. She turned away from the door and stepped into the street, only to jump back a moment later. A cart skidded to a stop within inches of where she was standing. “Nightmare!” Third Eye bellowed before resuming his examination of the library’s exterior. Despite her concerns about how demented the old stallion was, Rarity kept up her pleasant smile as she helped him up onto the library’s front step. She knocked on the door for him, and as before it only took a few moments for Twilight to answer. “I’m terribly sorry to bother you again, Twilight,” Rarity apologized. “but I was wondering if you’d mind letting me show this gentlestallion around the library for a moment. He’s a friend of...” Rarity trailed off. She had turned to look at Third Eye and found he was no longer standing beside her. He had retreated back several steps and lowered down into a defensive pose. He was visibly shaking, but it was hard to tell if was caused by fear or from forcing his old body into such a strenuous position. “See... you must see. You must see what I see, if only for a moment. Yes... I’ll make you see. You’ll all see, then you’ll all know, and then we can fight it,” Third Eye rambled. Before Rarity or anypony could stop him, a beam of light shot from his horn. The beam struck Twilight, and for a moment the unicorn’s appearance shifted. Twilight’s eyes, which had been hollow and distant, became pitch black and glossy. Her mane and tail changed from merely dirty to looking sickly and faded, like they were on the verge of falling out. Her teeth changed, becoming jagged fangs meant to rip and tear into meat: the teeth of a predator. With a gasp, Rarity stumbled and fell back, landing on the ground with a thud. Normally, getting so much dirt on her mane would have made Rarity jump right back to her hooves, but instead she remained where she was and focused her gaze on Twilight. Twilight’s frightening appearance had disappeared, and she once again looked simply sleep deprived and dirty. Her hollow gaze, however, became a hateful glare focused intently on Third Eye. “She is mine!” Twilight growled in an unnatural, low voice before stepping back into the library and slamming the door shut. That slam was soon followed by others as furniture inside the library was tossed and thrown against every door and window. Within moments, the library was barricaded against the outside world. With the discovery that Twilight had succumbed to the nightmare, Third Eye became hysterical. His paranoid ramblings gained fresh fervor and he began to prepare a complicated spell right in the middle of the street. The stallion, however, wasn’t allowed to continue his work. He was whisked back to Carousal Boutique at Rarity’s insistence. Rarity’s concern was that Third Eye’s behavior, his unrestrained ramblings of nightmares, ghosts, and danger, was just the sort of thing to cause mass panic in Ponyville. That was the last thing she felt they needed. Thus, she decided it was better if they kept Third Eye hidden away in her boutique until after nightfall. Third Eye rebelled against the idea, ranting about how nightmares only got stronger at night, but he was no match for Rarity’s wits. She convinced him that he could use the time until nightfall to prepare his exorcism spell, and that she would assist him. That gave Third Eye something productive to focus his pent up, paranoid energy on. While he and Rarity worked, Rainbow Dash and Spike went out to the rest of their friends, telling them what was going on and to meet at the library that evening. Once night fell and the streetlamps around Ponyville were lit, the group of friends began to gather. Applejack was the last to arrive, having to wait until everypony at Sweet Apple Acres had gone to sleep before she could sneak out. When she galloped up to the scene, her friends were all standing outside the library while an aged unicorn mumbled and ranted to himself. He was in the process of drawing a strange symbol on the ground with a bag of salt, just outside the library door. “Sorry I’m late, y’all. I didn’t want big Macintosh to see me leavin’ and wonder what was goin’ on,” Applejack apologized as she came to a stop beside her friends. “And when is the princess supposed ta be comin’ back?” Applejack asked. “Dangerous or not, I’m not going leave Twilight in there with that thing,” Rainbow Dash stated firmly. Pinkie Pie and Spike gave their heads a firm nod and saluted Applejack. Fluttershy, however, was trembling like a leaf. She was looking up at the library like it was a giant dragon that was about to eat her. It took a nudge from Pinkie Pie to snap Fluttershy out of her fear. “Yes, and do remind me never to get on your bad side, Applejack,” Rarity mused. She and Rainbow Dash followed Applejack inside. From the crashing and smashing Rarity and Rainbow Dash had heard earlier, they expected the library to be a disheveled mess. Yet, it looked only mildly disturbed. Excluding the few bookcases that were barricading the windows and front door, the rest of the library seemed untouched. The cleanliness of the library, however, didn’t ease the three mares’ nerves as they moved inside. While each of them had been in the library more times than they cared to count, it had never felt so threatening before. It was like they were walking into the Everfree Forest, entering a place where danger could be lurking anywhere. “Cornered doesn’t mean nothing to her, Sugarcube. After all, Twilight knows how to teleport,” Applejack pointed out. “Then what are we going to do?” Rainbow Dash asked. The other two mares nodded, following Applejack to the bedroom. The staircase was just as foreboding as the library’s main floor if not more so. As they climbed the steps, the air became colder and colder; it was like the mares were climbing some tall, snow-capped mountain. By the time they reached the bedroom door, each of them was breathing out puffs of steam. “Why is it so cold?” Rarity shivered as Applejack put a hoof on the bedroom door and started to open it. “Humph; if I had known that I would have brought my scarf,” grumbled Rarity as the trio of mares entered the bedroom. The windows were covered in a thick frost, and a mountain of books had been stacked in front of the bathroom door. There was no sign of Twilight, but there was something that drew their attention. “Hey, that’s my phantom speller,” Rainbow Dash said as she flew ahead. The game board and pointer were lying in the middle of the floor, flanked on either side by a pair of weakly glowing candles. Rarity and Applejack turned their attention back to the phantom speller, and with Rainbow watched as the pointer slid across the board with eerie efficiency. It paused and moved between letters at a constant, almost rhythmic pace, spelling out its message to the three watching mares. Rainbow Dash and Rarity both nodded in determination, stepping away from the phantom speller as they began to search the room, taking books off shelves and checking every nook and cranny they thought Twilight could squeeze into. As they did, the phantom speller continued to slide across the board, moving faster and faster as it spelled out its words with growing fervor. .. S.. H.. E.. I.. S.. M.. I.. N.. E..
. S. H. E. I. S. M. I. N. E.
The constant, grating sound of the phantom speller’s pointer moving across the board finally got to Applejack. She stomped over to the board and brought her front hoof down hard on the pointer, smashing it to pieces. “Hey! Why’d you do that?” Rainbow Dash asked as she flew over and examined the crushed remains of her phantom speller. “You got it,” Rainbow Dash said before dive bombing at the tomes and scooping up several at once before soaring away and dropping them at the far side of the room. Rarity also helped, though she was a bit more organized. She levitated the literature away piece by piece and stacked each tome neatly to one side. Still, despite their differences in approach, Rarity and Rainbow Dash both made quick work of the blockade. And as they worked, Applejack took the rope she had brought into the library and tied one end into a lasso before tying the other end to her tail. The farm mare started swinging her tail around, getting the lasso to circle in the air as she prepared to hogtie whatever happened to be on the other side of the bathroom door. “SHE IS MINE!” the three mares heard a voice call out to them, or rather two voices. The first and strongest voice was a deep, guttural, threatening voice that sounded like it came from some horrible beast. The other voice, which was underneath the first, was Twilight’s. That scream ushered chaos into the library. Just as Rainbow Dash and Rarity were clearing away the last books from the bathroom door it forced itself open and a figure came barreling out at them. The figure charged across the room, plowing through Rarity and Rainbow before jumping and tackling Applejack, pinning her to the floor. It was Smartypants. The doll had been transfigured and morphed from something of fond childhood memories to something found only in the most horrible of nightmares. It was now the size of Big Macintosh and just as strong. Her button eyes were replaced with ‘X’ shaped stitches along with a pair of stitched eyebrows which were bent down in rage. All across its body a number of its seams had opened to become dozens of gaping, hungry mouths filled with jagged, razor sharp teeth. Rainbow Dash sprinted across the room. “Hey! Get your hooves off her!” She fully intended to knock Smartypants off of Applejack. The doll, however, jumped clear at the last moment, leaving Rainbow Dash to careen into the library wall and become buried in a book avalanche. “W-where did it go?” Applejack asked. She scrambled to her hooves and looked about the room. Rarity rushed over beside Applejack. “I don’t know, I didn’t see. I was too busy watching Rainbow Dash. Is she going to be okay? “No, I really don’t like your mane!” Rarity snapped firmly, though she quickly regretted the insult. The harsh words made Smartypants’s many mouths cry out in an ear splitting rage before it dropped down from the ceiling. Smartypants would have fallen on both of them if Applejack hadn’t shoved Rarity clear. For a moment Rarity paused, but then her eyes flashed with determination. She ignited the magic in her horn. She waved her horn around and followed its silent directions. She passed by the avalanche of books where Rainbow Dash was struggling to free herself and came to a stop beside Twilight’s bed. “Rarity, what are you doing?” Applejack asked, putting her hoof on Smartypants’s head. It was all she could do to keep herself from getting bitten by the doll’s many mouths. “Improvising!” Rarity called out. She shoved Twilight’s bed to one side and picked up a box that had been hidden underneath. There was writing on the side of the box that read, “Spike’s Property: Do No Open!” She ignored the warning and flipped open the box’s lid to reveal a private collection of gemstones. A smile spread onto Rarity’s lips while she levitated the many fine jewels into the air. She inspected them for a brief moment, a pang flashing on her face. She regretted what she was about to do, but she did not hesitate a moment more. In a single bright flash, Rarity smashed the many pristine jewels into a cloud of jagged, razor sharp pieces. She turned and launched the gemstone shards at Smartypants. The shards ripped through Smartypants’s fabric like it was tissue paper, causing the possessed doll to stumble away from Applejack as painful cries escaped its many mouths. Still, Rarity persisted, drawing back the gemstone shards. With a circular wave of her horn, she turned the cloud of shards into a lethal vortex that encircled and consumed Smartypants. Rarity kept that vortex of shards going for a full minute before relenting from her attack. The tornado dissipated all at once, and the many gemstone shards fell to the floor to reveal a shredded mass of stuffing and fabric. “Shoot... Rarity, nice work!” Applejack panted out as she as walked over to her friend. Rarity just nodded, trying to steady her breathing while Applejack trotted over to the pile of fallen books. It took some digging, but she was able to pull Rainbow Dash out from beneath the tomes within a few minutes. Applejack was cut off as the shreds of fabric that had once made up Smartypants leapt up at her. Before she could duck away or protest, the swarm of tiny bits of fabric overwhelmed her and forced her down to the floor. Rainbow Dash tried to help her, but no matter how hard she tried she was unable to pull the pieces of fabric off of Applejack. They stuck to her like glue. “Get them off me!” Applejack hollered. She flailed her hooves around, trying to fight back against the swarm. “I’m trying!” Rainbow Dash shouted, only to be knocked away a moment later. The blow came from Applejack’s own hoof, an intentional strike that sent Rainbow Dash faltering back while holding her gut. With that final cry Smartypants threw herself at Rainbow Dash. Running on adrenaline and instincts, Rainbow turned and bucked at the doll. The blow was solid, and it sent Smartypants soaring across the room. At the same time, it made Applejack grunt out in pain, both when she was bucked as well as when she hit the floor. “But where should we look?” Rarity asked. She forced herself back to her hooves, ending her short moment of respite. “The bathroom!” Applejack shouted from inside the Smartypants costume as it turned to face Rainbow Dash. “This thing came runnin’ out of the bathroom. I bet it's tryin’ to protect it. Twilight must be-” Applejack’s last words were silenced as the fabric that covered her mouth constricted and forced her jaw shut. The doll’s mouths let out a horrible chorus of screams before charging Rainbow Dash down a second time. Rarity gave a nod and stood in front of Smartypants. She picked up the gemstone shards she used to defeat Smartypants earlier, intent on using the same trick a second time. Her resolve, however, faltered when she looked at Smartypants. She saw Applejack’s right eye staring back from inside the doll’s fabric, and she dropped the many shards. She could not shred Smartypants as she done earlier. The doll had become a costume which clung relentlessly to her dear friend. Smartypants took a step towards Rarity, its many mouths turned up in devilish grins. Looking back, Rarity’s heart skipped a beat when she saw the bathroom door was once against shut and blockaded by a mountain of books. Rarity also became aware of the sounds coming out from behind the bathroom door. It sounded as if the shower was running, and Rainbow Dash was pounding on the door. Her words were muffled by all the literature in front of the door, but the panic in her voice was quite audible. It was all too much for Rarity. With an ear splitting scream she sprinted for the door. Guilt already wrenched her chest. She was abandoning her friends, but the simple truth was they were in over their heads. Upon reaching the stairs, Rarity chanced a look back and saw that Smartypants was hot on her hooves. The glance back turned out to be a mistake. She tripped on one of the steps and fell forward just as she reached the bottom of the stairwell. On instinct, she curled into a ball and, after hitting the floor, rolled across the library’s ground level, crashed through the door to the basement, rolled across the landing, and tumbled down the basement stairs. The grand fall all ended with her sprawled out heap on the basement’s floor. Rarity’s head swam for several moments. She lifted her hoof to a sore spot on her skull, and was thankful when she didn’t feel any bleeding. She pulled herself back to her hooves, and took notice that the basement of the library was filled with a purple glow which emanated from the center of the room. There, seated in the center of a spell, was Twilight. The unicorn’s eyes were rolled back into her head and her horn was pointed at the ceiling. The spell being cast around her seemed to pull on the very darkness of the room. Black tendrils swirled in the air as they were drawn into Twilight’s horn, which looked as if it had grown longer since the last time Rarity saw it. “Twilight... what is this thing doing to you?” Rarity asked in a hushed voice. Rarity turned her head to the side just in time to see Smartypants leap at her from the top of the basement staircase. For a moment she thought only of dodging. After all, she didn’t want to hurt Applejack. Still, as Smartypants flew closer Rarity chanced a glance at Twilight. Her mind flashed with an idea. Horn flaring, Rarity called on her magic as quickly as she could. She did not have enough time to grab Smartypants out of the air, but she did have enough to change its trajectory. With a shove from her magic, she sent Smartypants soaring at Twilight like a sack of potatoes. The pair collided with a thud. Smartypants plowed into Twilight and knocked her clear of the dark spell. The pair rolled to a stop at the far side of the room, and as Rarity galloped over a smile formed on her lips. Applejack was getting up while the Smartypants costume broke back into shreds and falling to the floor. Applejack and Rainbow Dash came out of the library a few minutes later. Applejack was limping and Rainbow Dash was soaking wet from being trapped in a flooding bathroom. Thankfully, when Twilight was knocked free of the spell, much of what was happening in the library stopped. The clogged drains in the bathroom opened and the faucets turned off, allowing the water in the bathroom to drain down to a more manageable level by the time Applejack got the door open. “Just so we’re clear, if this thing does have a flank to buck, I get first dibs,” Rainbow Dash grumbled as she tossed her head to get some of her sopping wet mane out of her eyes. “Only after me, Sugarcube,” Applejack forced out through a grunt of pain. She and Rainbow Dash approached the exorcism spell. Twilight had been placed in the center, and standing around her in a triangle, while holding lit candles, was Pinkie Pie, Fluttershy, and Spike. “What was it trying to do with that spell anyway?” Rarity asked as she looked down at Twilight. Twilight’s body became wrapped in Third Eye’s magic and slowly lifted off the ground. He held her in the air for a few moments, and then his horn flashed. Twilight’s eyes opened wide and her body began to thrash violently in the air. Another flash of light erupted from Third Eye’s horn, and at the same time Twilight let out a dreadful scream. Her friends squirmed where they stood, each wanting to rush forward and help Twilight. They all, however, held back as they watched something black seep out of her. It was like a living shadow, and after all of it was drawn out Twilight flopped to the ground, unconscious. “Whoa there, what’s wrong?” Applejack asked. She tried to approach Third Eye, but he scrambled away from her. “Easy there, just take a breath,” Applejack said. She reached out for Third Eye in an effort to calm him. He, however, batted her hoof away. With that Third Eye broke into a gallop, charging past Applejack and bumping into Fluttershy. The sudden impact caused her to juggle with her candle before dropping it, the flame extinguishing as it hit the ground. With one of the three candles gone, the shadow that was the nightmare poured back into Twilight. When the last traces had gone back inside, her eyes opened and her horn glowed. “She is MINE!” Twilight screamed, her voice once again echoing with the deep, guttural roar of the nightmare. “Hurry, Spike, get that candle lit!” Applejack shouted. She jumped Twilight, grabbing hold of her and pinning her to the ground. “And somepony get Third Eye back out here! We need him to finish that sp–oof!” Applejack stumbled as she struggled to catch her breath. The possessed Twilight had just bucked her in the stomach. Without anypony holding her down, Twilight floated into the air above the street. Her eyes were a ghastly black and her teeth changed, becoming the fangs of predator. She was calling on all of her magic at once. Her horn glowed brightly while mane and tail flowed, as if she was submerged underwater. “She is mine!” Twilight shouted. Her booming voice echoed across town and drew ponies out of their homes to form a large crowd around the library. “She will help me get her! I will get her back! She was mine! She will be mine again! Everything will be mine!” With that final proclamation, Twilight began picking up and hurling anything within reach at the crowd of ponies below. Branches from the library, rocks, everything and anything became a weapon for her. Panicked screams and shouts began to fill the air. The ponies who had come out their homes quickly ran away while Twilight’s friends remained behind. They jumped and dodged around the attacks of the possessed Twilight, trying to figure out not only how to recapture their friend but convince Third Eye to finish his spell. It was amidst the chaos that a green cloud of smoke appeared. It enveloped the street, blinding everypony as it across the town, going into every door and window. The cloud, however, did not originate from Twilight, and it was affecting her just as it affected everypony. As every resident of Ponyville fell into a deep slumber, the possessed Twilight fought against the cloud’s effects. She thrashed, waving her hooves to dispel the cloud while searching for the one responsible. Her eyes eventually fell on a figure walking amongst the sickly green haze. The pony wore a cloak, and was moving over to where Third Eye had collapsed. The sleep-inducing cloud had gotten to him while he was being dragged back out of the library by Rainbow Dash. Roaring with her nightmarish echo, the possessed Twilight dove out of the air with murderous intent. “Mine! This is all mine!” she screamed at the top of her lungs. “You are a spoiled brat. Worse, you’re a greedy rat.” The figure lectured before jumping into the air and spinning around. The spin became a roundhouse kick, one that connected with Twilight’s chest and sent her crashing to the ground. The blow rattled the nightmare within Twilight, and for a moment her head cleared. “Wh-o? What? Where am I?” Twilight asked. She looked around, only to cringe and put a hoof to her head as the nightmare inside began retaking its control. The eyes of the cloaked figure lit up, and the pony’s teeth became jagged and monstrous. She arched her head back, and with a loud roar, like a predator pouncing on its pray, lashed forward to attack. Twilight to let out an ear splitting scream. She felt the figure biting down on her neck. Twilight bolted up in her bed, drenched in a cold sweat and panting heavily. She looked around in a panic and quickly lifted her hooves to her neck. She breathed a heavy, relieved sigh when she didn’t feel any bite marks. It had all been just a bad dream. It was just been a dream... but what had the dream been about? Already her mind was having difficulty holding onto the memory. All her friends were there, and Smartypants was a part of the dream as well. There was also something about a ghost and... a phantom speller? Then it all ended when some really scary figure attacked her. Groaning, Twilight held her head as the memories of her dream faded. Whatever it had been, it had been scary, but that was over now. The sun was up, she was in her bed, and she was perfectly safe. The library looked to be in perfect order, and on a whim Twilight checked on her Smartypants doll and saw that she too was exactly where she was supposed to be. Looking out her bedroom window, Twilight saw that ponies were already outside and running around in their costumes, despite the fact Nightmare Night didn’t start until that evening. She even saw Pinkie Pie, and couldn’t help but laugh at the sight of her friend dressed as a chicken and pecking at the ground. The morning seemed utterly perfect, except for a green haze that seemed to linger in the air. Still, Twilight didn’t give the haze a second thought. She got out of bed, taking notice that it hurt a little to move. Her chest was particularly sore, but Twilight just chalked it up to needing a shower. She trotted over to the bathroom and began to plan out her day. She would get cleaned up real quick, and start getting ready for what would be one of her best Nightmare Nights ever. She had a great costume, she was going to hang out with good friends, and she would probably eat far more candy than she should in one evening. In all, it was a Nightmare Night she was eagerly looking forward to. Some distance away from the Ponyville Library, later that afternoon, another unicorn awoke. Third Eye groaned and blinked several times to clear his vision as he came to. He was lying on the floor, hogtied, in a pitch black room. From the soreness of his side, Third Eye guessed he had been there for several hours. He tried to use his horn to undo the knots that bound him, but his magic slipped off the rope like it was greased. He could not get a grip. Third Eye tensed. The words sounded as if they had been spoken by two ponies in unison, one voice deep and threatening while the other was more feminine, wise, and almost motherly. It was a pair of voices Third Eye knew came from a single source, for it was a pair of voices he had heard before. The darkness of the room broke as a fire came to life. The fire was beneath a large cauldron, heating its contents and filling the room with a nausea inducing odor. A figure moved back and forth in the space between Third Eye and the fire, the harsh shadows making her appear as nothing more than a silhouette. “Oh, Third Eye, I would think you’d be happy to see me. It’s been so long since we last encountered one another,” the two voices said as the figure measured out a spoonful of a powder for her brew. “The other nightmare. It was acting alone! No, that cannot be true! You had a hoof in this. You wanted revenge! Nightmares are patient. You are patient! You would have waited and planned. I almost beat you, and I bound you in bones. I warned the town about you. Warned them of your hunger and cursed eyes. I warned them of your glowing gaze. Yes, this is your plan. This is your plan for revenge,” Third Eye rambled. He tried to crawl away, only to find the ropes around his legs were tied to a heavy chest. “No, that cannot be true! I bound you in bones to make Ponyville safe. You cannot walk amongst them freely, you can’t!” Third Eye roared. “In... invited! ?” Third Eye stuttered out. The figure chuckled and rounded the cauldron, her face becoming illuminated by the fire and bubbling brew. She was a zebra with gold rings in her ears and around her neck, blue eyes, and a grim smile on her face. At that Third Eye found himself being lifted off the floor. To any other pony, it was like he was floating without support. He, however, could see the trails of nightmare energy that seeped out from behind the cauldron and carried him in view of the bubbling soup. Third Eye’s gaze went wide as he looked into the sickly green stew and saw, thanks to his special talent, that a nightmare was trapped within the liquid. It was the same nightmare that possessed the purple unicorn at the library. It was being cooked alive, its energy being drawn out by the potent potion it was submerged in. Third Eye felt himself being lifted higher. The tendrils of nightmare energy that flowed from Zecora raised him into the air above the bubbling cauldron. Third Eye quickly realized what was about to happen, and struggled with as much strength as his aged body could provide. With that Zecora released Third Eye, a single, final scream escaping from the aged unicorn’s throat as he dropped into the cauldron’s bubbling brew. He did not surface even once, the powerful potion already rending soul from body. All the while Zecora watched with an eager smile as her appearance shifted. Her teeth became jagged and her eyes began to glow with a haunting yellow light. Zecora licked her lips a few hours later while she stepped out of her hut, letting her tongue pick up on the last traces of her very filling meal. She was already dressed in her Nightmare Night costume, and was thankful she chose to wear such a long dress. It worked well to hide her slightly distended gut. As her hut fell out of sight and she continued along the forest path, Zecora pulled at her costume and inspected a pocket, seeing a quantity of green powder inside. Her supply was running low, since it took most of her stockpile to erase the other nightmare’s presence from Ponyville. Still, Zecora smiled and confirmed she had enough for the evening, despite repairing damage and altering memories the night before. After all, she couldn’t let another nightmare ruin Ponyville.